We’ve been in Uganda more than week and it’s been all I could have wished for the students and more. The Backpack Journalism crew this year is fantastic — hard-working, open, enthusiastic, uncomplaining. We’ve experienced a lot from the chaos of Kampala rush hour traffic to miles of muddy, rutted roads in the countryside that don’t quite deserve that description where our intrepid bus driver Sam used what we are now calling “Sam-wheel drive” to get us through. My Fitbit translated the bumps and bounces into more than 19,000 steps for the day. The landscapes are ever changing, from the roadside towns we passed through to small clusters of villages with the thatched-roof round houses that are everywhere. What I love about these journeys is the chance to meet and talk with people — Lewi, a South Sudanese refugee building a life for his family in Kampala; Sharon, a journalist working for a radio station in Adjumani, focusing on the stories of women and girls; Father Kevin from Jesuit Refugee Service in Kampala and Isaac from JRS office in Adjumani. These people and countless others generously give us their time and stories. They make us feel most welcome even as we lug around cameras or ask them to move heavy wardrobes so we can get the best shot. (We helped move them.) We are most welcome as the wonderful students try to learn the words for at least hello and thank you in the native languages — we are up to about three different languages. I am sure we will hear “You are most welcome” many more times while we are here. I am most grateful. 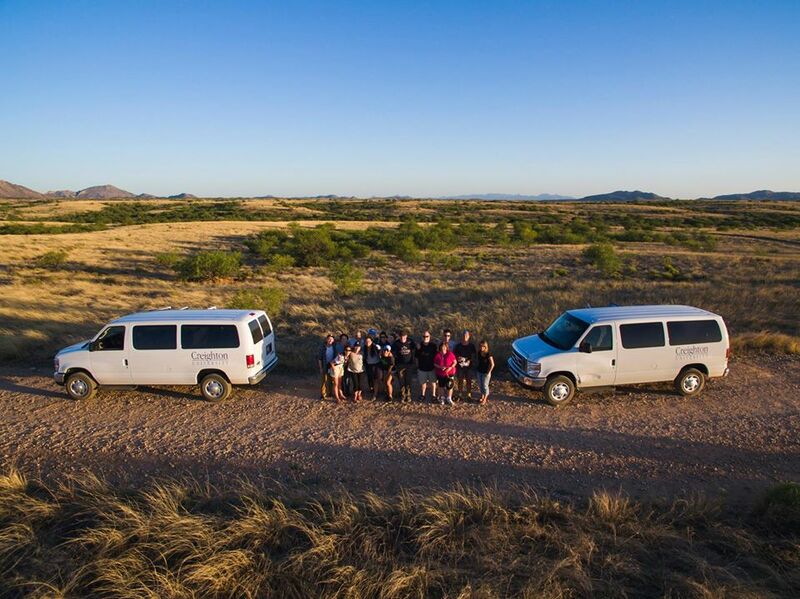 There’s a moment in Backpack Journalism that’s a bit of a tipping point, when the students who have been thrown together on this adventure, traveled long distances start emerging from their comfort zones. In two of the journeys, we have fish to thank. 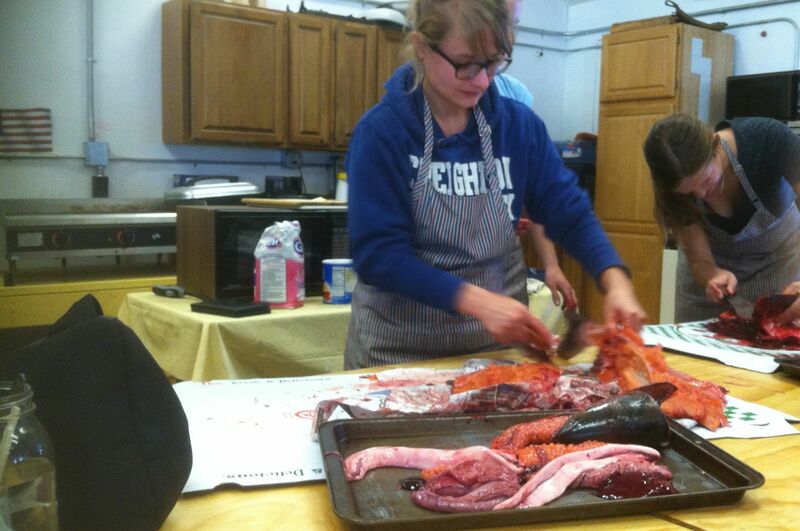 In Backpack Journalism Alaska, Hannah Mullally took up the challenge of learning how to gut a whole salmon, and soon she was teaching others how to use the Yup’ik traditional knife. That salmon tasted so good. After that, students stepped up to take on roles in filming and interviewing, trekking on the tundra, trying new foods and making the most of the experience. Hannah Mullally, left, helps Erin Kurvers gut a salmon during Backpack Journalism Alaska 2014 in Bethel, Alaska. This time, the fish story involved a wonderful Lake Victoria lunch: french fries and whole tilapia, freshly caught and fried. It was Liz Rudigier who led the march out of the comfort zone as she tried the eyeball of one of the fish. (“Gooey and a little crunchy.”) Soon, Natalie Lynam, Jacob Tilstra, Zach Brittain and John O’Keefe had a go. It’s a good sign. We take up the hard work of filming interviews, learning about refugees and the work of the Jesuit Refugee Service on Monday. 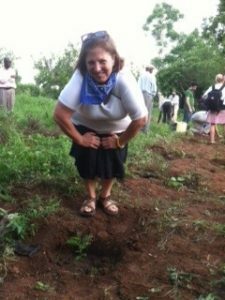 Carol Z and the tiny tree she planted when in Uganda in 2012.
eo, theology, blogging, journalism, filmmaking and — most importantly — about themselves. We meet in class for the next week and leave for Uganda on May 31. We’ll be in Uganda — mostly northern Uganda — until June 18. Then we meet again in the Hitchcock Building to produce a rough cut of the film. 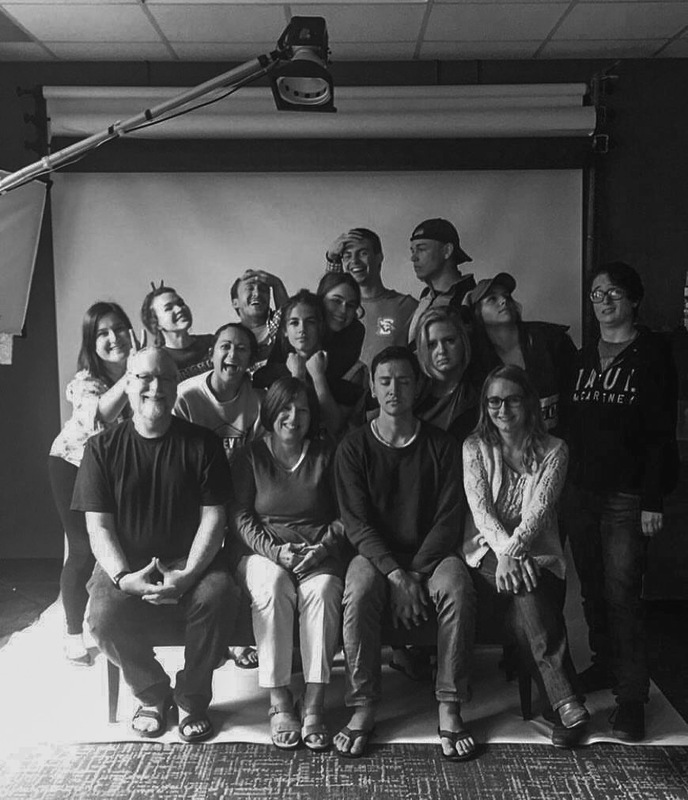 The process is one of constant discovery as students learn about the cameras and group dynamics and the personalities of the three professors. In Uganda, we all will be stretched to work to tell the stories we find there. It’s a journey I’m privileged to be a part of and one I’ve looked forward to since 2016 Arizona. Our last Backpack Journalism trip to Uganda was in 2012. As part of that trip, I planted a tree, thanks to our generous hosts there. I hope it has grown as much as I have since then. 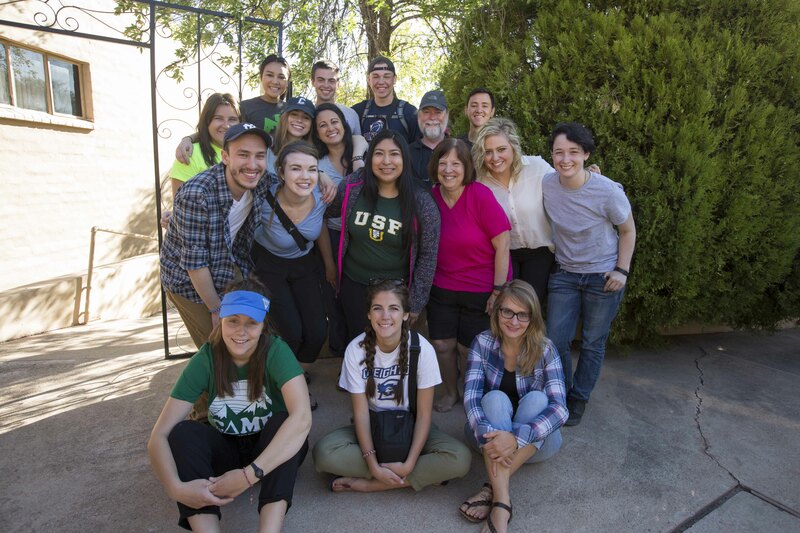 I’m not sure where the two weeks went that we spent in Nogales. It’s a blur of work, of intense experiences, of laughter, of tears, of learning about migration, our country, ourselves. 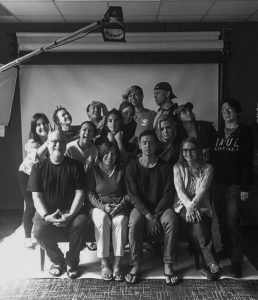 I have said it before and I’ll say it many times again: John O’Keefe, Nico Sandi, Nichole Jelinek and I are blessed to work with such a terrific group of students. Their dedication to the project, to the learning and to the community we built is something to be treasured. John, Tim Guthrie (one of our team who couldn’t make this trip) and I often say we want to make a good movie, but our main goal is to make good people. We have much work to do in the next one and one-half weeks. What we experienced will sink in with reflection and time away. I am confident this year we will have a good film. We already have good people. The Backpack Journalism group with Daniela Vargas outside our home away from home. vely. My dog. My bed. My house. But as I try to tell family and friends about my experiences over the past two weeks, I am a little at a loss for words. 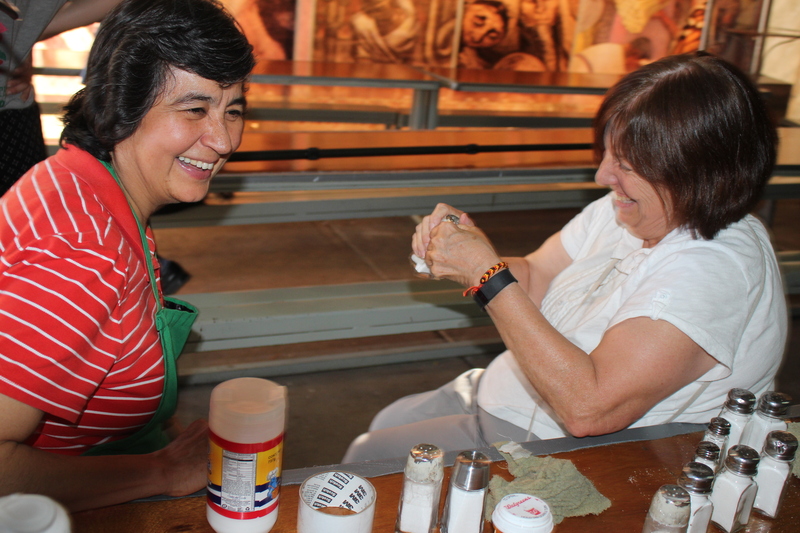 How can I adequately explain that moment in the Kino Border Initiative comedor when Sister Alicia — playing a simple game of gestures — brings smiles to the faces of men who have been and still are lost and struggling? How can I describe the stark desert landscape scarred by the metal, rusting wall that seems to symbolize inhumanity? itness can make you sad and uncomfortable. Bearing witness can mean you have tears rolling down your face as your listen to a young woman’s story of her migrant family and the responsibility she feels. One of the best and worst parts of being a journalist is your closeness to tragedy and to joy and to everything in-between. What you learn can make you angry or frustrated or just happy.
. Their capacity to bear witness and their dedication to the task inspire me everyday. 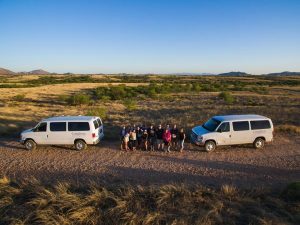 We have packed a lot into a few days, spending most of our time at the border or in Mexico at the Kino Border Initiative. We have walked along the wall, seen the “cattle chute” that deported migrants must walk through. We have watched those mostly recently deported migrants come into the comedor, the Kino Border Initiative’s soup kitchen, clutching their backpacks or plastic bags that hold everything. They look lost and scared and hungry. 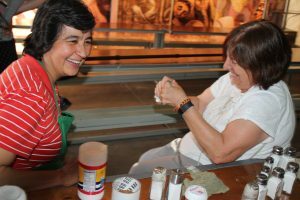 For a short time, in the midst of feeling lost, there can be a sense of belonging.The people who work there and the volunteers do everything to be welcoming. 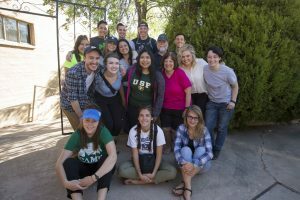 One example is Sister Alicia of the Missionary Sisters of the Eucharist, one of the partner organizations at the Kino Border initiative. She and other sisters work in the comedor and the women’s shelter. In the comedor, she never stops moving and never stops smiling. That smile, the movement all help to make the migrants feel at home, feel like people after a dehumanizing system has left them without a place. Sister Alicia and everyone at the comedor work to make it a welcoming and warm place. The migrants are served the meals. Short presentations before the meal focus on dignity, rights, a song about hope. The volunteers or Sister Alicia lead the migrants in short hand exercises or cheer contests. It’s beautiful to see the faces light up with smiles and laughter. There’s prayer too. One of the themes we are hearing likens the comedor to the Eucharistic table where gifts are prepared and shared. The power of hearing the familiar cadences of the “Our Father” — even in a language I don’t understand — brings tears to my eyes. Every time. I have been lucky enough to hear and recite that prayer in the Dominican Republic, in Africa and now at the border. I asked the students to write a blog post about what they are learning in our whirlwind week of video, theology and feature writing. It made me realize how much I learn every time I embark on this adventure. I learn how deeply rooted Jesuit values are in these students and I am thankful for that. I learn how quickly a community can form, one that is accepting and open and really funny. I learn how glad I am for Father Daniel Hendrickson’s Creighton Global Initiative. Backpack Journalism received one of the grants and I am thankful for that. But this year I am thankful that A.J. Olnes was on the committee AND decided to join Backpack Journalism. I’d call that Creighton Global Initiative in action. I learn how generous and connected the Backpack Journalism alums are as they read and comment on the blogs and show up for our reflection send-off. I learn the power of saying yes to things that challenge and scare you. Thanks to all who are helping me learn this important lessons. 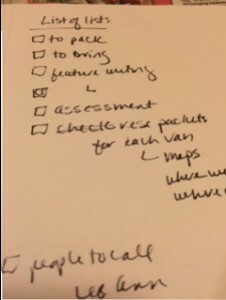 I’m finishing up getting my work ready for our Backpack Journalism class when it begins tomorrow. 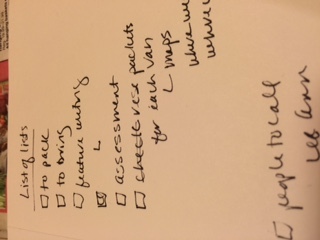 And I’m working on my list of lists for this week: Things to pack, things to bring, people to call, work to do. And as I try to manage all of this, I keep smiling. Smiling because even though there is work and there are many miles and many loose ends to chase down, I am so grateful and happy to start on another Backpack Journalism trip. We have a terrific group of students. We have an important story. We have experiences ahead that I know will deeply touch all of us. So bring on the road trip, the heat, the long days, the laughter and the conversations, the joy and the sorrow. I think I’ll start with a prayer that I used when we went to Uganda. It’s perfect for journalists and everyone else. Adapted by John Veltri, S.J. Teach me to listen, my caring God, to those far from me — the whisper of the hopeless, the plea of the forgotten, the cry of the anguished. Teach me to listen, O God my Mother, to myself. Help me to be less afraid to trust the voice inside in the deepest part of me. Teach me to listen, Holy Spirit, for your voice — in busyness and in boredom, in certainty and in doubt, in noise and in silence. Teach me, Lord, to listen. Amen. I love the lingering twilight of a Nebraska summer, when it seems it stays light so long. 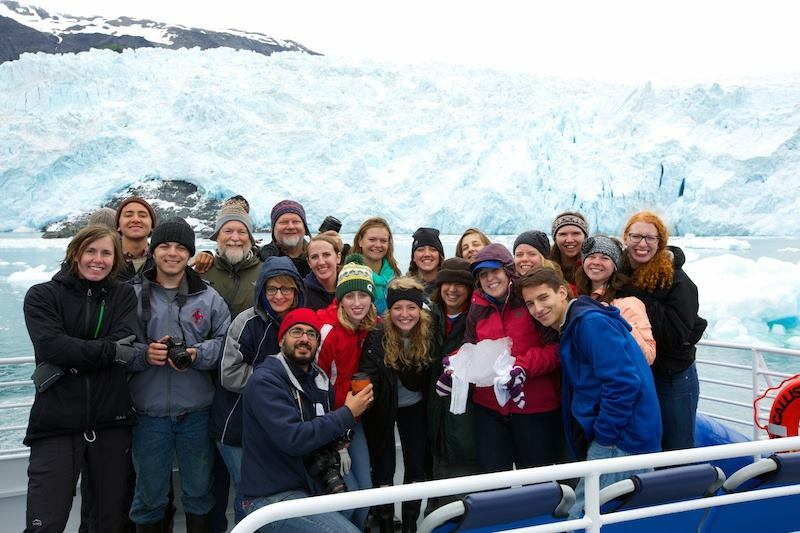 The Backpack Journalism 2014 group and a glacier. I’m glad to be back home with my dog and my shower and my couch and my bed. But I do miss the light. And the horizon of Bethel. And the mountains of Seward. And the group of people I spent so much time with. That light I will carry with me. Nichole Jelinek preparing our freshly caught salmon for lunch. We’re nearing the end of our time in Bethel and already we are thinking of how we are going to miss the community here, the sunlight (I’m writing this at 11:30 p.m. and it’s bright daylight outside as the sun is just starting to set.) and the amazing opportunities we have to talk to the diverse people here and learn about their lives and culture. We’ve been able to see and hear first-hand about the impact of climate change. The stories we are hearing are not just technical, science-type stories, but stories deeply rooted in these people’s connection with the land. We’ve heard the tundra — which seems vast and barren at first glance — described as the “land’s plate” and the “people’s refrigerator” for the rich bounty of berries and greens that helps sustain people all year. Many of the people we have talked to learned about the land and respect for the land, sea and rivers and all that inhabit the environment from their elders. They talk of respect for the land and for the animals they catch, whether it’s salmon or moose or caribou. Being from Nebraska, I know about sky and Plains stretching all around me. But here in rural southwestern Alaska, there’s more sky and more tundra. People have told us while on the tundra, they feel they can see the whole universe. It does feel that way. The respect for the land and for the elders is grounded in sharing what you catch and harvest with the elders, widows and, we have found, with strangers. We are overwhelmed by the generosity in fish, cookies, produce and a wonderful pot luck. 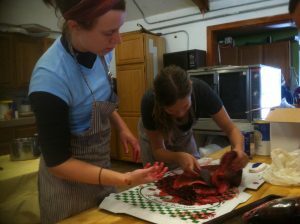 It took a while to get back to this blog; now It’s time for lunch, which today is fresh salmon from the test fishery. People working to conserve and preserve the king salmon on the river do test catches to see how many fish are running, what kind and when. The goal is to get enough king salmon to escape to spawn upriver. Part of today’s catch — which is often distributed to elders and others — will end up on our lunch plates. Our story comes full circle.